Once a respected member of King Triton's court, Ursula has since been banished from the kingdom due to her misuse of dark magic and fondness for devious manipulations. Her command over the darkness grants her membership in Maleficent's circle of villains, in which she not only searches for ultimate power by taking control of her world's Keyhole, but also oversees the kidnapping of the Princesses of Heart alongside her allies. Possessing the ability to spy on Sora, Donald, Goofy and Ariel, Ursula determines the naive princess to be the weak link in their group ,and her opportunity arrives when Triton destroys the Crystal Trident. Approaching the weeping mermaid with promises of bringing her to the outside world, Ursula is able to appeal to Ariel's heart and requests to be taken into Triton's throne room, in which she believes the Keyhole is hidden. Though she is able to lay her hands on the trident, the Keyhole is still out of reach. Tapping into the powers of the seven seas, Ursula grows to gigantic size to destroy Sora, Donald, Goofy and Ariel, but not even the trident can protect her, and she fades into a cloud of black smoke. A manipulative sea witch, Ursula once lived in the palace before she was banished for her love of black magic and the power of darkness, a love that persists even until today. She has been scheming to wrest control of Atlantica from King Triton, nearly succeeding in Kingdom Hearts, but she was defeated by Sora, Donald, Goofy and Ariel even with the trident at her side. 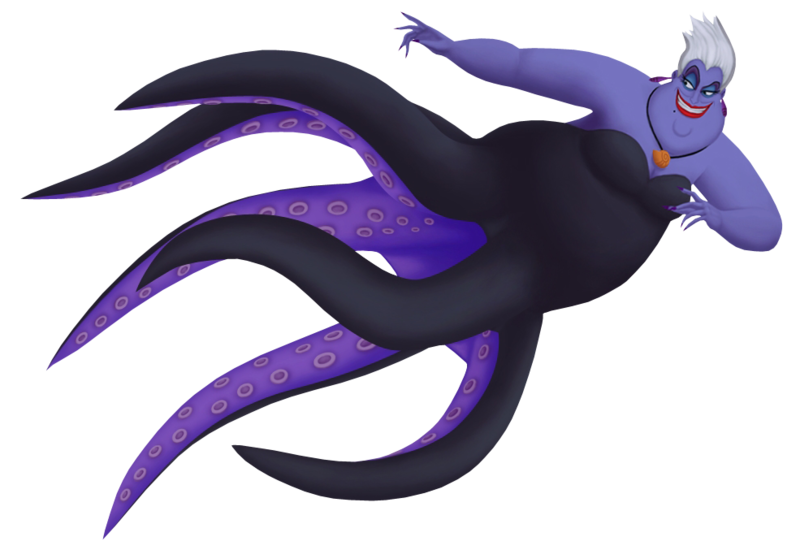 Ursula returns in Kingdom Hearts II, approaching Ariel once more in her time of need. Under the pretense of wanting to help, she convinces Ariel into making a deal with her: In exchange for her voice, Ariel would be turned human and is given three days to make Eric fall in love with her, otherwise she will belong to Ursula forever. The deal is made, the contract signed, now all the Sea Witch has to do is lean back and watch as the now mute Ariel struggle to communicate with Eric. To her horror, Eric falls in love with Ariel despite the barrier in communication. Deciding to take matters into her own tentacles, she transformed herself into a beautiful woman named Vanessa, and hypnotized Eric into falling in love with her using Ariel's voice. Her plot is foiled once Sora destroys her necklace, but the deadline is up. Once Triton sacrifices himself in exchange for Ariel's safety, the trident and crown is hers once again. Nevertheless, her most prized obsession turns against her once Eric uses the trident to spear her, destroying her and releasing her hold on Triton. A sea with who hails from Atlantica, she has vexed Sora on multiple occasions. Sora and Riku are sent across time and space back to the Destiny Islands on the night they fall into darkness. By comandeering their own raft, Sora and Riku set sail into the realm of the Sleeping Worlds. But as the storm breaks overhead, Ursula emerges from a pool of Darkness to welcome Sora and Riku to their Mark of Mastery Exam. As Sora and Riku defeat Ursula and the storm comes to a cresendo, Ursula vanishes into thin air with a static smile, appearing to be nothing more than a phantom.